I am not sure what the Farmer’s Almanac says this year but my new and imaginative prediction is that it is going to be very cold. Stock up on extra kindling before the snow falls because we had a very clear message from a squirrel today. Despite Elsa Beskow saying that squirrels are scatty thoughtless creatures, we know they can also be quite the contrary, possessing such great effort and grand intentions. At the start of each day I like to sit at the kitchen bench and have a cup of tea. I try to always daydream out the window while I am drinking tea, as a healthy gentle measure and to take a little moment to connect with the goings on in our yard. As I sat there sipping my tea quietly, suddenly, an energetic ball of blue burst out of the fir trees that line our yard. This blue mass was hopping on the ground erratically, sort of haphazardly and for a moment I forgot where I was and thought it was some rare blue breasted tropical bird of my Australian childhood. My neck straightened and stretched as I tried to work out just exactly what it was that was moving with such fervency in our yard. It was quite the show and it could have been a long feathered lyre bird doing a mating dance. “Girls quick, look out the window!” I hollered, “There is something strange happening in our yard!” I was not even sure exactly what it was at that moment but I knew Maya and Elle would not want to miss it. “It is a bird or something, quick look out the window!” I had to let the girls know it was an animal of some sort so that they knew to move quickly. Sightings like this can be over in the blink of an eye. I heard the girls footsteps run across the bare wooden floorboards in the room above, and knew that they were both now peering out the window on the second floor directly above the kitchen window of which I was looking out of. Together, but on different floors of the house we were all taking in the same scene. By now the bright blue thing was bounding across our yard and was close enough for us to see just exactly what it was. “Oh my goodness!” I exclaimed, it is a squirrel, and it has something big and blue in its mouth!” The squirrel was really in a state of effort and concentration. In that wonderful determined squirrel way it was on a quest. It had stopped for a moment to regroup and that is when I realized. “It has our prayer flags in its mouth!” I declared. The squirrel’s hands were busily scrunching back up the long colorful garland of Tibetan flags, grasping and bundling it all as tight as it could. I could see it’s head bobbling about as it tried to fit as many of the bright fabric pieces into it’s mouth as possible, ending with the blue on top. Once it had a good hold, it continued across the grass to a broad trunk, where it began a long journey up the largest tree in our yard. 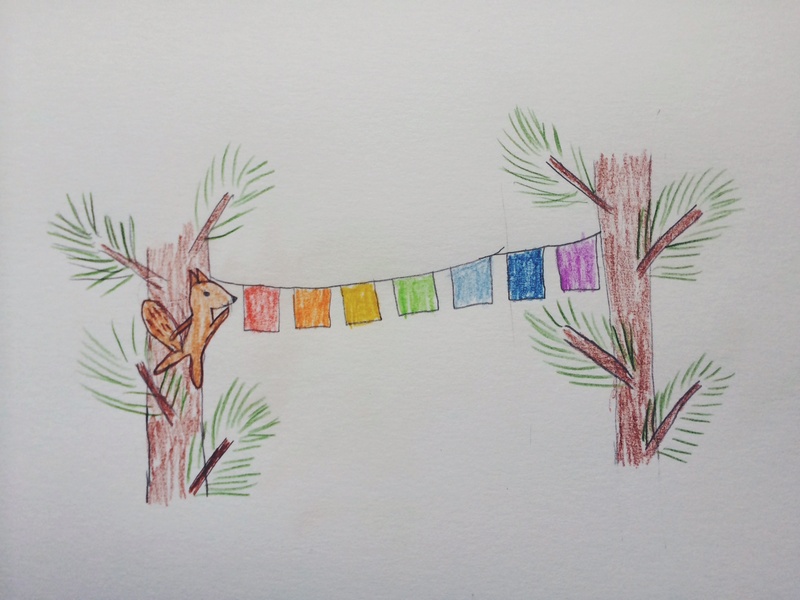 Now if we take a step back to a moment ago we can only imagine that the squirrel had been in the girls tree house were the flag were hanging, and for some reason it had decided it needed to take the prayer flags to it’s nest. The prayer fags hung between two fir trees in a brushy sheltered play space, each end had been securely tied, and so getting the pray flags down, was a task in itself. I had just happened to be sitting at the kitchen window to catch this eventful mission in full swing. From the windows we watched the squirrel climb to the third set of forks in the branches, and then once it was out of sight we decided to go and investigate. The three of us made our way outside and stood beneath the tree, gazing up to the squirrel nest. A small hole could be seen in the wood of the tree. There was no sign of fabric or squirrel, but we knew of course, they were both tucked away inside. Now as I write this we are actually having some of the warmest winter days, but what we know with the current climate change patterns, is that whether becomes more erratic and more unpredictable, extreme highs, extreme lows, no snow, lots of snow and so really, what is important is that we remember, what it is to be December. Artwork By Maya Skene, Words By Kirsten Rickert, all rights reserved. This entry was posted in G E N E R A L and tagged amanda blake soule, animals, storytelling, taproot, weather, winter. Great story-telling, Kirsten. I was first drawn in by Maya’s lovely illustration. Satya and I like to imagine the nest lined with prayers to keep the squirrel cozy and safe all winter. Phoebe, thank you, It meant a lot to me that you were drawn to this post in particular. I am still trying to work out my energy and flow, and you have helped. Thank you.